myNewYorkeye--what's in it for you--is on our annual road trip to Hollywood! Good news for talented people especially around on of my favourite directors Gina Prince-Bythewood ! She is one of the most gifted screenwriters - directors working today and her newest film BEYOND THE LIGHTS which stars the stunning and gifted Gugu Mbatha-Raw along side Nate Parker, Minnie Driver and Danny Glover is a must see if you haven't seen it and if you have, a must see again! I love the fact that the song “Grateful" has been nominated and that singer, songwriter and actress Rita Ora will perform the Oscar®-nominated song “Grateful” at the 87th Oscars. That bit of news was shared by the show producers Craig Zadan and Neil Meron and unless you live under a very big rock, you know that the Oscars, will be hosted by Neil Patrick Harris. The fun will air on Sunday, February 22, on ABC. "International recording artist, Rita Ora, will make her Oscar stage debut this year. The mixture of her incredible voice and glamour makes a perfect combination for our show" says Zadan and Meron. “Grateful,” written by Diane Warren for the film “Beyond the Lights,” is nominated for Original Song. Ora dominated the U.K. charts with her first and certified platinum album “Ora” (2012), which included the number one singles "R.I.P.," "How We Do (Party)" and "Hot Right Now." Currently featured on the smash single "Black Widow," with fellow superstar Iggy Azalea, Ora is readying her second full-length album, to be released this spring. She will appear in a number of upcoming films, including the highly anticipated “50 Shades of Grey” and Jake Gyllenhaal's “Southpaw” to be released in July. To keep on the music tip - musical artists Common and John Legend will perform their Oscar®-nominated song “Glory." 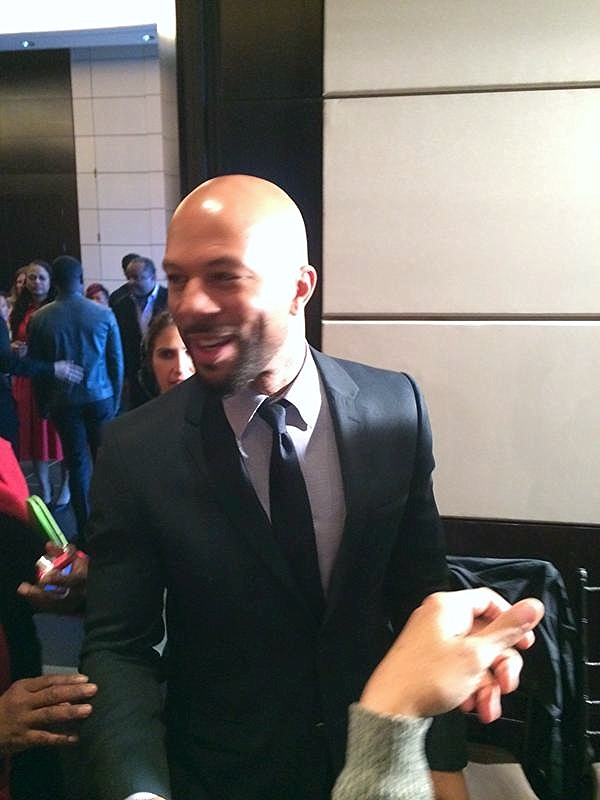 Common won a Grammy® in 2002 for Best R&B Song for “Love Of My Life (An Ode To Hip Hop),” and in 2007 for Best Rap Performance by a Duo or Group for “Southside,” with Kanye West. His many acting credits include the films “American Gangster,” “Wanted,” “Date Night” and “Selma,” in which he plays the role of Civil Rights leader James Bevel. Legend is a nine time Grammy-winning singer/songwriter. His critically acclaimed debut album, “Get Lifted,”scored multiple Grammy Awards in 2006, including Best R&B Album, Best New Artist and Best Male R&B Vocal Performance. The follow up was the platinum-selling “Once Again,” which garnered a Best Male R&B Performance nod. Legend’s most recent highly acclaimed fourth studio album, “Love in the Future,” scored two Grammy nominations and features his break out hit, “All of Me,” which is his highest selling and charting song to date and also earned a 2015 Grammy Award nomination for Best Pop Solo Performance. MYNEWYORKEYE - ROAD TRIP - HOLLYWOOD - SAG AWARDS - NOMINATIONS ANNOUNCED! · ETHAN HAWKE / Mason, Sr.
· MATHIEU AMALRIC / Serge X. 2011, 2010 – FEMALE DRAMA – "The Good Wife"
2007 – MOTION PICTURE CAST – "Little Miss Sunshine"
2007 – COMEDY ENSEMBLE – "The Office"
2013 – MOTION PICTURE CAST – "Argo"
2013 – MALE DRAMA – "Breaking Bad"
2001 – MOTION PICTURE CAST – "Traffic"
2001 – MALE SUPPORT – "Erin Brockovich"
1996 – MOTION PICTURE CAST – "Apollo 13"
1996 – MALE MOVIE/MINISERIES – "Truman"
BENEDICT CUMBERBATCH / "The Imitation Game"
MALE MOVIE/MINISERIES – "Sherlock: His Last Vow"
2014 – MOTION PICTURE CAST – "12 Years A Slave"
2014 – MOTION PICTURE CAST – "August: Osage County"
EDDIE REDMAYNE / "The Theory of Everything"
FELICITY JONES / "The Theory of Everything"
2013 – FEMALE MOVIE/MINISERIES – "Game Change"
ROSAMUND PIKE / "Gone Girl"
MOTION PICTURE CAST – "Boyhood"
MOTION PICTURE CAST – "The Grand Budapest Hotel"
MERYL STREEP / "Into The Woods"
2013 – FEMALE LEAD – "The Impossible"
2004 – FEMALE LEAD – "21 Grams"
BENEDICT CUMBERBATCH / "Sherlock: His Last Vow "
MARK RUFFALO / "The Normal Heart"
1999 – MALE SUPPORT – "A Simple Plan"
1997 – MALE LEAD – "Sling Blade"
WILLIAM H. MACY / "Shameless"
2007 – MOTION PICTURE CAST – "Bobby"
2007 – MALE TV MOVIE OR MINISERIES – "Nightmares & Dreamscapes"
2005 – MALE TV MOVIE OR MINISERIES – "The Wool Cap"
2004 – MOTION PICTURE CAST – "Seabiscuit"
2000 – MOTION PICTURE CAST – "Magnolia"
1998 – MOTION PICTURE CAST – "Boogie Nights"
2013, 2012 – MALE COMEDY – "Modern Family"
2013 – COMEDY ENSEMBLE – "Nurse Jackie"
2014 – FEMALE COMEDY – "Veep"
2014 – COMEDY ENSEMBLE – "Veep"
2010, 2007 – FEMALE COMEDY – "The New Adventures of Old Christine"